A lot of people are starting to come to the realisation that their life needs a bit of an evaluation. In an age where we are constantly connected to our phones, workplace and the internet it can be hard to switch off. Some will have burned out. Some will be low on energy or frustrated with their job or career. 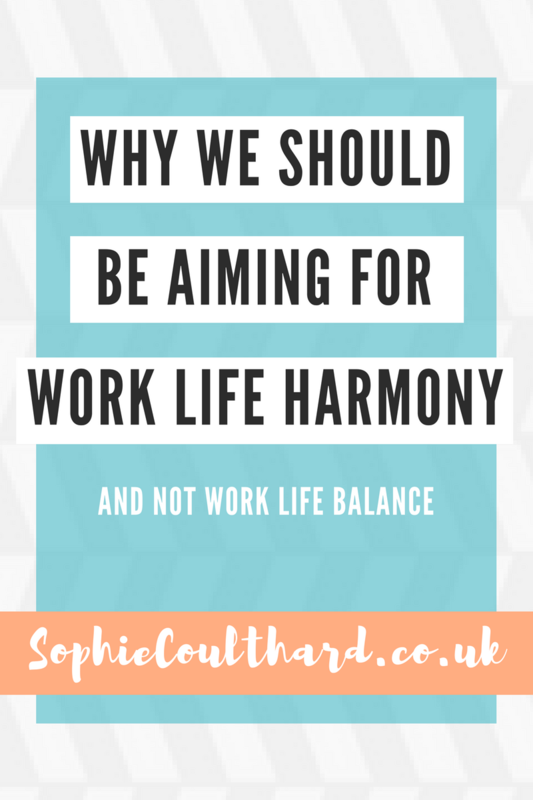 Many will refer to this as trying to find work life balance, but I'd like to put forward a lesser used term, a term that I fell defines what people are really trying to find, which is work and life harmony. Work life balance is the go-to phrase that's over used in my opinion. Balance implies equal; a set of scales with an equal weighting towards work and life. But in fact, so many of us have a very blurry line between work and our own lives. Our work colleagues may have become our closest friends, we may work for ourselves, our hours may not be defined by the standard 9-5. And so if we were trying to find equal balance, it might not be possible and it might not even be what we really desire. Harmony is a state when everything is in agreement. I like to think of it as a flow of work and life that are both agreeing with each other. If you make a plan to look towards work and life harmony then you're more likely to find what feels right for you. I have some staggering stats to share with you on this. From our research at the Judgement Index, we have found that 93% of people are better at looking to the needs of the external (which is the needs of work and others) than they are at looking to the needs of themselves. The way the results of the assessment work, is that they are split. So, half of what is measured is looking at our judgement and values based behaviours around the external world, which is typically work and others, and the other half is looking at our internal world; how we reflect on ourselves and our behaviours around ourselves. Because of the maths and science behind the assessment it's able to give an actual rating on your own work and life harmony. It's amazing what a rating, score or number can do to wake someone up to the reality of how they're living their life. This year a manager of a large company said to me that he didn't care if his staff looked after themselves or what was going on in their personal lives, as long as they turned up for work and do their job. What he didn't realise is that while many people do that, and mask their personal issues, he would get so much more out them if they put a focus and energy on their own wellbeing and needs. People who have their work life harmony in check will typically be self assured, confident, look after themselves, have clear direction in life, be able to cope with any outside stress or pressures going on and look after their wellbeing. Surely that's the foundation of any great employee? Imagine a two tier wedding cake. Now imagine our "self side" is at the bottom and our "work side" is at the top. We want that bottom tier to be ideally larger, but certainly the same size as the top tier to give it the support it needs. When we neglect ourselves, and put all of our energy into work, we are taking away from that bottom tier and making the top tier larger and sitting on what I like to call a wobbly foundation. When the bottom tier is much smaller than the top tier, it might balance for a certain period of time, but at some point it might just tip over. I think this image perfectly explains why it's so important to put energy into yourself, and why if you don't, you'll most likely burn out further down the line. And many credible leaders have been quoted as saying the mistakes they've made in their careers have been because of lack of good judgement, caused by lack of energy. So it's time to start thinking about how you could restructure that wedding cake to get the most out of work and life. How could you start to prioritise your own wellbeing? If there are stress factors in your personal life, can you remove either the stress? Or yourself from the situation? If not can you find a way to cope better with it? What can add more value to work for you? What could make it more meaningful? How self critical are you and is that impacting on your own self esteem? How could you gain a stronger sense of what is important so you can clearly prioritise and not constantly be harassed by urgency? As you can see these are much deeper questions than advising someone to turn off their work email after 7pm. That's the beauty of the Judgement Index, it really gets under the skin of someone and allows them to really reflect on what they can change and work towards. If you're curious as to what your work and life harmony score would be, or how wobbly that wedding cake would look under the Judgement Index microscope then don't wait until the top tier tips over. Enquire now about taking the assessment and find out how you can build that foundation to get more out of work and life.